It takes around 20 minutes to make a risotto – plus lots of stirring! But risottos are incredibly simple to make and you can easily adapt them with different flavours and ingredients. Heat the olive oil in a large frying pan, add the onion, and fry for a couple of minutes, until soft but not browned. Add the rice and stir well, then pour in the wine and allow it to bubble and almost evaporate. Add a ladle of stock and stir constantly until it has all been absorbed, before adding another ladle. Repeat this process until three-quarters of the stock has been used up then add the prawns and cook for 2 minutes, until they turn pink, stirring all the time and adding more stock as needed. Add the courgette and cook for 4 to 5 minutes, then tip in the spring onions and the peas, stirring all the time and adding more stock until the rice is cooked but still has a bit of texture. Take the pan off the heat and stir in the butter and parmesan. If the risotto becomes too thick and claggy, add a little more stock so it has a slightly runny consistency. Finally, check the seasoning and stir through the herbs, then serve straight away with a little more grated parmesan and lemon zest. 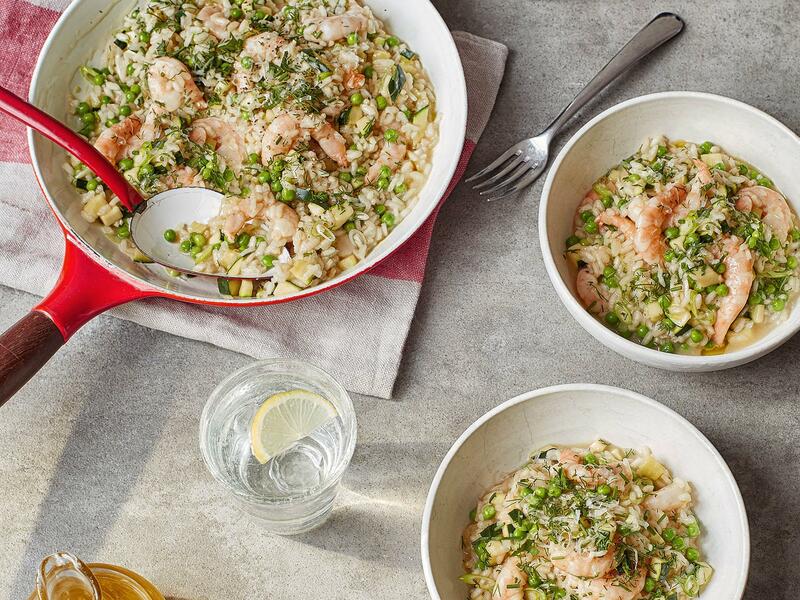 Feed the freezer: Cook the risotto up to the point where you add the prawns, then cool quickly and freeze. Thaw in the fridge, warm in a pan, and carry on from where you left off. Flex the flavours: Cook piles of grated parmesan on a lined baking tray for 3 to 5 minutes at 180C (350F/Gas 4) until golden, cool slightly, then serve with the risotto to add a nutty flavour. Love your leftovers: Use any leftover risotto to make the crispy arancini balls on page 188 in the book. This is my take on black forest gâteau. I don’t often have time to bake a cake and fill it so this cheat’s version uses shop-bought cake or leftover brownies. It’s a great dinner party dish. Make the mousse the day before, then take it out of the fridge 20 minutes ahead to bring it to room temperature and soften it. Place the chocolate in a bowl set over a pan of gently simmering water. Allow it to melt slowly then remove from the heat. Whisk the egg whites until they form stiff peaks, then whisk in the sugar. Whisk the cream in a separate bowl until it stiffens. Once the chocolate has cooled slightly, fold in the cream, followed by the egg whites. Divide the mixture between 4 larger or 6 smaller glasses. At this stage you can pop these in the fridge to chill and take them out 20 minutes before serving to finish off assembling the trifles. Mix together the cherries and the booze, if using. When you are ready to serve, top the chocolate mousse with some of the cake cubes, the cherries, and a dollop of the crème fraîche and finish it all off with a cherry half and a grating of dark chocolate. Flex the flavours: Add a little orange zest for extra zing, and/or a tablespoon of strong coffee to the melted chocolate and simply change the cherries for raspberries or strawberries – or even some orange segments if you fancy. The problem with traditional pies is there’s just too much pastry – on the top and on the bottom – leaving little room for anything else and making them a really heavy dish. This is my way of cutting back on the pastry and upping the veg. It makes a lovely starter or lunch dish. Preheat the oven to 200C (400F/Gas 6) and place a large baking sheet in the oven to warm up. Heat the butter in a frying pan and add the leeks. Cook over a medium heat for about 5 minutes, until they are soft and taking on a little colour, then add the sage and cook for another minute. Season well with salt and pepper and leave to cool slightly. Mix the ricotta and eggs together then stir in the chilli, parsley, and lemon zest and season with salt and pepper. Carefully lay the puff pastry sheet on the hot baking sheet and use a knife to make a 1cm (1/2in) border around the edge, taking care not to cut all the way through. With a fork, prick the pastry inside the border, making sure it has a good covering of fork marks. Spread the ricotta mixture over the pastry, keeping the border clear, then spread over the leeks and finally scatter over the pine nuts and parmesan. If you wish, brush the pastry border with a little beaten egg to give it a nice golden colour and shine. Bake on a high shelf in the oven for 20 minutes, or until the pastry is golden brown. Top with a few more parmesan shavings and serve with a green salad. Flex the flavour: Top the pie with 100g (31/2oz) blanched asparagus spears to add an additional layer of flavour.